From ancient times, the rise and fall of the River Nile portended periods of famine or good fortune for the peoples of Egypt. Other than wells, the River Nile is the only source of water in the country. During an idyllic year, the flooding of the Nile would begin in July, and by September its receding waters would deposit a rich, black silt in its wake for farming. Before taming the river, however, the ancient Egyptians had to overcome the river’s peculiar problem. The Niles runs along an alluvial plain, the ebb and tide of the Nile corresponding to an annual movement of the ground. When the Nile is the lowest, the ground completely dries up. When it floods, the water seeps into the dry soil and causes the ground to rise as much as a foot or two like some bloated sponge. As the inundation subsides the ground settles again to its original dry level, but never settles evenly. The name Egypt means “Two Lands,” reflecting the two separate kingdoms of Upper and Lower prehistoric Egypt – Delta region in the north and a long length of sandstone and limestone in the south. In 3000 B.C., a single ruler, Menes, unified the entire land and set the stage for an impressive civilization that lasted 3,000 years. He began with the construction of basins to contain the flood water, digging canals and irrigation ditches to reclaim the marshy land. From these earliest of times, so important was the cutting of a dam that the event was heralded by a royal ceremony. King Menes is credited with diverting the course of the Nile to build the city of Memphis on the site where the great river had run. By 2500 B. C., an extensive system of dikes, canals and sluices had developed. It remained in use until the Roman occupation, circa 30 B.C. – 641 A.D.
For pure water, the Egyptians depended upon wells. Their prowess in divining hidden sources is shown in the “Well of Joseph,” constructed about 3000 B.C. near the Pyramids of Gizeh. Workers had to dig through 300 feet of solid rock to tap into the water. Plumbing For the Dead: Egypt’s pyramid-temples which have withstood thousands of years of time also attest to the skill of the ancient construction workers. The earliest pyramids were built from 2660-2500 B.C., a period running parallel with the Sumer-Mesopotamians when they achieved their greatest advances in civilization. Yet any cultural ties that Egypt had with Mesopotamia had vanished by this period. A stone bath with plastered sides and drain. Just below the outlet of the bath, water drained into a vase perforated at the bottom and cemented into the earth. By 2500 B.C. the Egyptians were pretty adept with drainage construction, accentuated by the significance that water played in their priestly rituals of purification and those affecting the burial of the kings. According to their religion, to die was simply to pass from one state of life to another. If the living required food, clothing and other accoutrements of daily life, so did the dead. Thus, it’s not surprising that archaeologists have discovered bathrooms in some tombs. Excavators of the mortuary temple of King Suhura at Abusir discovered niches in the walls and remnants of stone basins. These were furnished with metal fittings for use as lavatories. The outlet of the basin closed with a lead stopper attached to a chain and a bronze ring. The basin emptied through a copper pipe to a trough below. The pipe was made of 1/16″ beaten copper to a diameter of a little under 2″. A lap joint seam hammered it tight. Also found within a pyramid temple built by King Tutankhamen’s father-in-law at Abusir, was a brass drain pipe running from the upper temple along the connecting masonry causeway to the outer temple on the river. Excavators have discovered a tomb which supposedly contains the body of Osiris before he became a god. It contains the dividing line between Life and Death, i.e., a deep moat containing water that surrounds all sides of the figure of the god on his throne. After 5,000 years, water still fills the canal through underground pipes from the River Nile. Coppersmiths: The ancient Egyptians were early developers of pipe and the techniques of making copper alloys. In the beginning, of course, their pipe and fittings were very crude. Like the Mesopotamians, they used clay pipe made from a combination of straw and clay. First it was dried in the sun, and then baked in ovens. As they improved upon their clay sewer pipe, the Egyptians were able to drain the low-lying portions of the Nile Valley, and gradually the entire region evolved into a fertile garden. It is here in Egypt that the noria or Egyptian wheel became a common use. As in Mesopotamia, it consisted of a chain pump comprising a number of earthen pots carried round and round by a wheel. Other examples of their craftsmanship are found in bowls of beaten copper on which they casted double spouts. 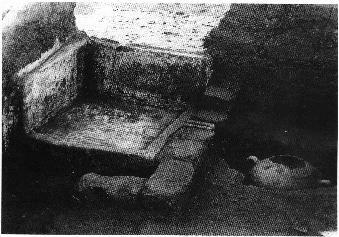 Originally copper basins were used only by the pharoahs. The homes of the wealthy were airy and roomy, literally. There were bedrooms, servants’ quarters, halls, dining rooms – and bathrooms. Actually, a “bathroom” was usually a small recessed room with a square slab of limestone in the corner. There the master of the house stood while his slaves liberally doused him with water. The waste water ran into a large bowl in the floor below or through an earthenware channel in the wall where it emptied into still another bowl outside. Then that bowl was baled out by hand. Remains of early earth closets with limestone seats also have been discovered, the disposal evidently in the sandy soil. Many other details of Egypt’s past are lost in obscurity. But of their engineering skill there is no doubt. Knowing only the lever, roller, inclined plane and possibly a long copper saw, they erected immense monuments in the desert sands and along great cliffs. When anyone reflects on ancient Egypt today, the Great Pyramid of Cheops and its staggering dimensions invariably are brought to mind: It stands 481 ft. high and contains 2 million blocks of yellowish limestone. Each block weights 2.5 tons, was quarried miles away, floated on barges, and dragged from the shores of the Nile to its present site. The other monument of renown is the Sphinx, guardian of the pyramids, which the ancients carved out of bedrock. It is shaped like a crouching lion with a human head. Unfortunately it was built before the services of a good Roman plumber were available. Located outside present day Cairo, it has lost limestone blocks to the marauding influence of underground water pollution – caused mainly by nearby villagers throwing household and human waste out in the street.